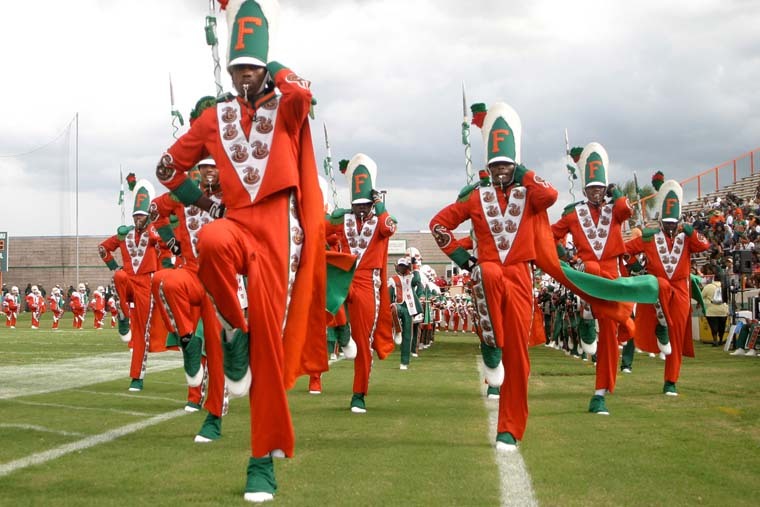 Drum Majors of Florida Agricultural and Mechanical University's Marching Band, 2017. Courtesy of Florida A&M University. 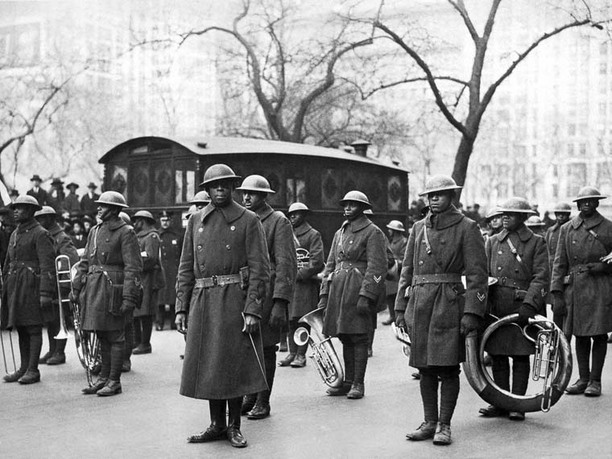 Marching On explores marching performances as mediums for communicating cultural identity and political resistance, specifically examining the role of marching bands and drumlines within African-American communities in asserting both visibility and equal rights. 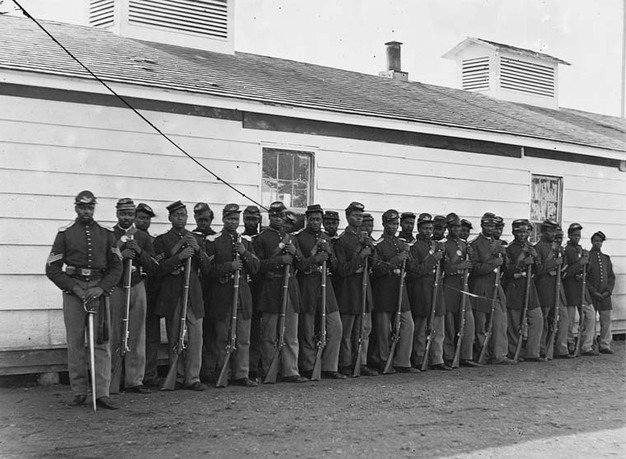 Rooted in military training exercises and even combat itself, marching bands and drumlines were historically used to acknowledge military service in African-American communities and the absence of civil rights despite sacrifices to defend the nation. 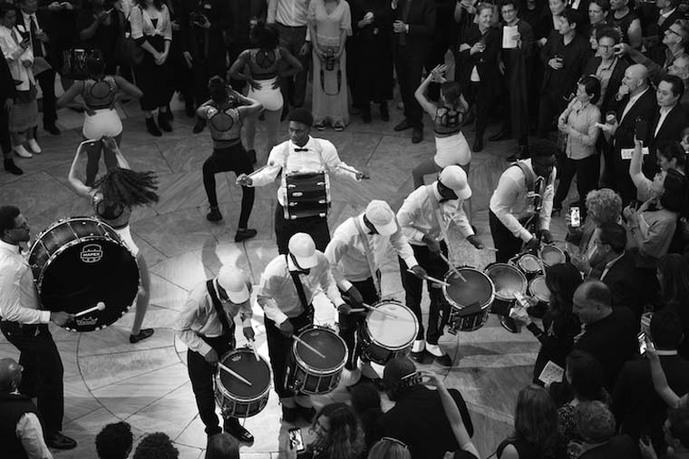 These performance forms have radically expanded since the nineteenth century to include dance lines with hip-hop and stepping choreography, but they remain connected to a strong political lineage. 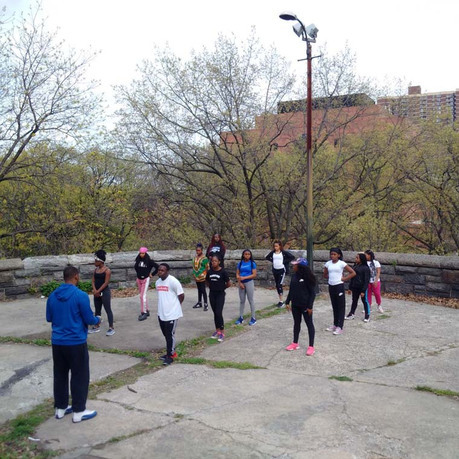 Addressing both historical and contemporary meanings, this project celebrates the medium of marching performance through both site-specific performances in Harlem and an exhibition at Storefront for Art and Architecture. The performances focus particularly on the long lineage of street performance in Harlem and the power of such performance to articulate heritage at a moment of rapid change. Bryony Roberts, lead curator, is an architectural designer and scholar. She earned a BA from Yale University and an MArch from Princeton University. Her work has been supported by the Graham Foundation and was featured in the 2015 Chicago Architecture Biennial. She has published widely in design and mainstream publications, and has taught at Rice University, SCI-Arc, and the Oslo School of Architecture. In 2015, she was awarded the Rome Prize from the American Academy in Rome. Roberts's practice integrates architecture, art, preservation, and performance to activate and critically engage historical buildings and urban spaces. With projects at sites such as Piazza del Campidoglio in Rome, Federal Plaza in Chicago, Government Quarter in Oslo, and Neutra VDL House in Los Angeles, her practice operates across many scales, from temporary installations to urban design. This range aims to foster social activation of historical sites and critical discourses on how we preserve and change existing structures. Mabel Wilson, lead researcher, navigates her transdisciplinary practice between the fields of architecture, art, and cultural history. She is a professor of architectural design and theory/history at Columbia University’s GSAPP, where she directs the graduate program in advanced architectural research. She co-directs GSAPP's Global Africa Lab and the Project on Spatial Politics. She also holds an appointment as a senior fellow at the Institute for Research in African American Studies. Wilson's design experiments, scholarly research, and advocacy projects focus upon space, politics and cultural memory in black America; raciality, technology, and aesthetics; and the globalization of architectural practice. Eva Franch, co-curator, is a New York–based architect, curator, educator, and lecturer of experimental forms of art and architectural practice. Holding master's degrees from ETSA Barcelona (UPC) and Princeton University, Franch specializes in the making of alternative architecture histories and futures. Since 2010, Franch has been the chief curator and executive director of Storefront for Art and Architecture in New York. Franch has lectured internationally on art, architecture, and the importance of alternative practices in the construction and understanding of public life at educational and cultural institutions. 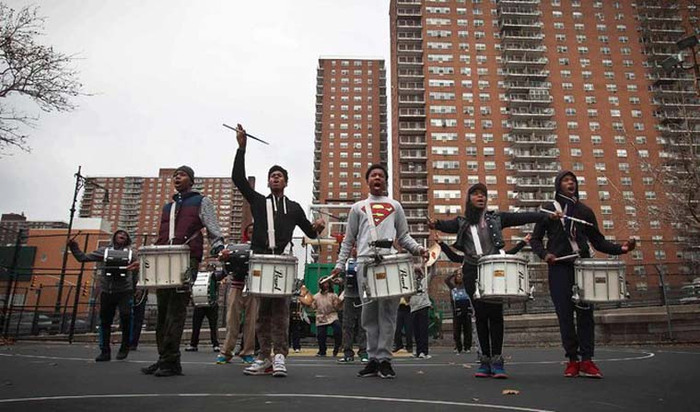 The Marching Cobras is a youth performance group based in Harlem that includes a 25-person drum line and a 25-person dance line. The Marching Cobras will be the lead artists involved in the performance and exhibition. Workshops with the group will guide the collaborative design of the live performances. 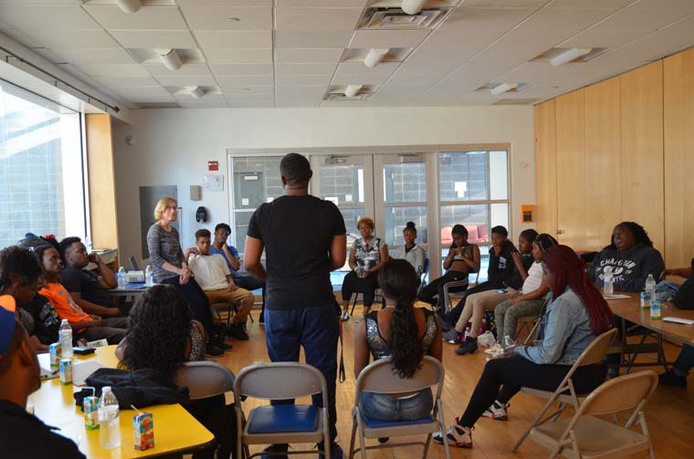 Their mission is to "enrich lives of youth by providing opportunities for artistic expression and leadership development through music, marching band, step, dance, and much more." Storefront for Art and Architecture advances innovative and critical ideas that contribute to the design of cities, territories, and public life. Storefront's exhibitions, events, competitions, publications, and projects provide alternative platforms for dialogue and collaboration across disciplinary, geographic, and ideological boundaries. Since its founding in 1982, Storefront has presented the work of over one thousand architects and artists.